The story of Arthur, a powerful tribal leader who brings political stability to 5th century Britain but fails to deliver a golden age. Originally named Arran, a country stable-boy, a loner who looked after Lord Ector's horses, he is suddenly thrown into the daunting world of war and politics, and is renamed Arthur. Initially reluctant to accept the role of king, he is briefly intoxicated by the power it gives him. He alternates between boyish hesitation and kingly authority and occasional arrogance. Seventeen year old Arthur has grown up as Arran, stable boy to Ector of Cantia. He is visited by Merlin and begins to have waking dreams about a moment in his early childhood when he was taken from his mother by Merlin and given to Sir Ector. Arthur comes to London. Sir Ector is killed. Rival warlords Bryce and Kerwyn each put themselves forward to take the sword from the stone and claim kingship. They both fail, Arthur steps forward and is proclaimed king. The action of the play lasts over two days in January 493 AD. he tribal leaders refuse to accept Arthur as king. Arthur is determined to impose law and effectively starts a civil war. Arthur falls in love with Rhyannon, the young wife of King Lot of the Orkneys. He sleeps with Rhyannon, who becomes pregnant. Keir challenges Arthur, and the sword of Kingship shatters in his hand. In penance, Arthur takes Keir to search for the Black Dog. Arthur meets Gwenfar, the daughter of Leodegrance of Caerleon. The action of the episode covers two months from March - May 493 AD. Through a message delivered by Gwenfar, Merlin directs Arthur to the sacred grove, and he receives 'Excalibur' from the Lady of the Lake. Rhyannon we learn is in fact Margawse, Arthur's half-sister. Rhyannon gives birth to Mordred and kills herself. 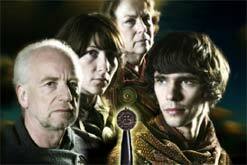 Morgan vows to protect her nephew, and to bring him up safe from Merlin's clutches. The action of the episode covers the last weeks of 493 and the first weeks of 494 AD. Seven years have passed. For the last five years Arthur has ruled with his Queen, Gwenfar, at his side. There is stability in the kingdom, and Camlot is established by the sacred lake. But Keir has broken his agreement with Arthur and has led a raiding party into King Pellyn's lands across the Humber. Pellyn is a Christian, and Keir has killed his bishop and stolen his neice, Maura. Maura's brother, Lanslot, arrives at Camlot demanding to have combat with Keir. Merlin says that war with Pellyn is inevitable, but Arthur is determined to try and broker peace. He meets Pellyn and meets Elaine, Pellyn's daughter, who tells him that she is pregnant by Lanslot. Arthur manages to achieve a peace, but back at Camlot Maura has been sacrificed. The action of the episode takes place in March 501 AD. A further fourteen years have passed, and two young men are making their way to Camlot. Mordred, now twenty-one, and the 15 year old Galhot, son of Lanslot and Elaine. They see Lanslot and Gwenfar bathing in the river together, and when they reach Camlot, Mordred challenges Lanslot to combat. As Mordred gains more influence at Arthur's court, and Lanslot learns that Galhot is his son, Arthur sends Galhot on a quest to find the Holy Grail. The search for the grail comes to a climax just as Arthur is brought by Mordred to witness Gwenfar and Lanslot's betrayal. The action of the episode takes place in 515 AD. Gwenfar and Lanslot have been sentenced to death for adultery and treason. Merlin's vision of Camlot is fading fast. The land around the sacred lake is barren and the lake itself is polluted. The only answer to Camlot's problems appears to be war - against the Saxons who have settled on the East Coast. Arthur, Gawain and his knights set out to fight the Saxons. The battle is won, but while he is away, Mordred has declared himself King. The two forces meet for the Last Battle. Lanslot arrives, but too late to save Arthur. The action of the play is continuous from episode 5.